Kusadasi, one of Turkey’s principle holiday resorts,situated on the west coast of Turkey- 90km south of Izmir. Kusadasi, is reputed for one of the most attractive city of the Aegean, as it is close to the important historical sites including Ephesus, Didyma, Priene, Miletos-the principals of ancient times, and ideal for sightseers. Kusadasi has a typical Mediterranean climate with hot summers and mild winters, providing a long tourism season.This city is bathed in sunshine for 300 days of the year. Numerous sandy beaches with warm & clear waters, providing a peaceful atmosphere, allow a great variety of water and beach facilities. Windsurfing, water skiing, sailing and beach volley are only a few choice for the lovers of active life. After sunbathing restfully during the day, the city awaits the greatest sunset behind the Pigeon Island. As the sun sets, the attractive cafes and restaurants through the palm-lined boulevard, get busier. It is a great delight to watch the comings and goings of the yachts and ships with accompany of the panoramic view of the sunset. As many of the west coast holiday resorts of Turkey, Kusadasi region is also tolerates gay couples. Because some gay cruise ships also stopped by here for many years the hotel owners, the local shops are familiar with openly gay tourists. 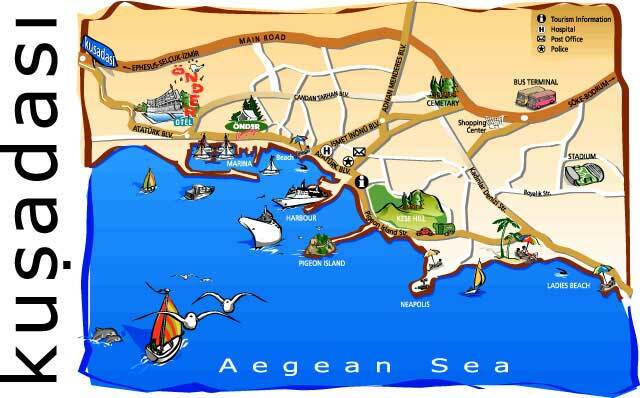 Many gay Turkish guys from Agean(West) region of Turkey come to Kusadasi to spend their holiday. GAY BEACH: Kusadasi doesn’t have a gay beach but one of the famous beaches of Kusadasi, Ladies Beach (Kadınlar Plajı) may be good for gay cruising. But don’t forget to be discreet. GAY CLUB : Kusadasi have one openly gay club called TATTOO. Kusadasi’s only gay club. Guest Dj performances and gogo boys some night. Local guys,Turkish guys from Agean region and tourists. GAYSOFTURKEY.COM BLOGGER Dj Murat Renay plays at Club Tattoo Kusadasi this weekend… Don’t miss this! *Please note that our listed “gay places” are for information purposes only. GaysOfTurkey.com and TurkeyGayGuide.com does not take any responsibility for your safety in these establishments.